Having witnessed how acoustic technology can elevate the dining experience at their restaurant Comal, restaurateurs John Paluska and Andrew Hoffman have again integrated Meyer Sound Libra and Constellation acoustic systems into their newest culinary venture. 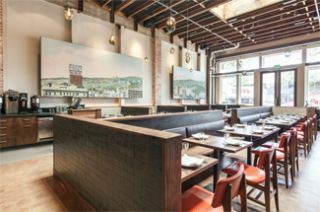 The Advocate, located in the Berkeley, CA Elmwood neighborhood, combines soulful northern Californian fare with Meyer Sound variable acoustics to create a multi-sensory dining space in which guests can converse easily over a comfortable background buzz. Paluska pushed the importance of restaurant sound to the forefront when he installed Constellation in Comal in 2012. "After the success we had with Libra and Constellation at Comal, there was never any question that we would also incorporate them at The Advocate," said Paluska. "It's always worthwhile putting extra effort into making a room sound its best at all times, and it's particularly crucial at The Advocate, as it's a large room with a lot of hard surfaces." Working as an integrated concept, Meyer Sound acoustic systems allow restaurant operators to dial in a lively buzz as needed, while always maintaining separated conversation spaces at every table. The Libra acoustic image system helps establish a controlled baseline acoustic, and through a network of loudspeakers, microphones, and digital processing, while Constellation introduces de-correlated regeneration of the ambient acoustical environment — a soft-blurred sonic background — with the precise level of reverberation characteristics suited to the current occupancy level and desired mood. The system is configured in two zones, allowing restaurant staff to offer different energy levels for the bar and dining areas using a custom iPad app for control. With seating for about 100, The Advocate occupies 3,400 square feet in what was originally Wright's Garage, a historic 1918 brick structure. To subdue this inherently reverberant space, the ceiling was treated with acoustical damping materials and one entire wall was devoted to two very large, acoustically absorbent Libra panels created under the art direction of Deborah O'Grady. The treatments dropped the reverberation time by more than a full second. The Constellation system comprises a D-Mitri digital audio platform housing the patented VRAS acoustical algorithm, 26 UP-4XP loudspeakers, two Stella-8C installation loudspeakers, and 10 MM-10XP subwoofers. The Advocate was designed by Abueg Morris Architects, also responsible for Comal. The restaurant menu focuses on southern Mediterranean and Moroccan cuisine.